A proper résumé and effective job-hunting skills can go a long way in getting a foot in the door. 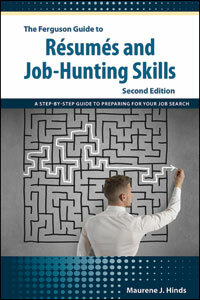 An invaluable handbook for those looking to improve their ability to find a job, The Ferguson Guide to Résumés and Job-Hunting Skills, Second Edition covers all the essential elements of the job-hunting process—from finding a career track that matches one's needs and interests to organizing and writing a résumé and cover letter to getting and conducting successful job interviews. This updated edition features new sample cover letters and résumés, plus expanded coverage of putting your résumé online, submitting cover letters and résumés electronically, and using social media such as LinkedIn as a form of résumé. Interviewing: what to expect and what to accomplish, communication techniques, dressing right, fielding and asking questions, and following up. The perfect guide for those looking to improve their résumé or find the right job, The Ferguson Guide to Résumés and Job-Hunting Skills, Second Edition is packed with authoritative, up-to-date information. Maurene J. Hinds is an Academy Certified Résumé Writer (ACRW) and member of Career Thought Leaders. She holds an M.F.A. in Writing for Children from Vermont College and has more than 10 years of experience as a professional résumé writer. In several years as a faculty member in the American Public University System and Montana State University and currently at Western Governors University, she has helped guide and develop student writers for several years. She lives in Montana with her family.